Insurance company increases its policy-writing production by 400 percent with addition of automatic typing equipment. Three banks of automatic typing equipment, installed in the underwriting section of the Combined Insurance Co. of America, Chicago, have increased the company’s policy-writing output 400 percent. One typist operating each bank of four units can produce as many policies in a day as four girls were able to produce typing policies, identification cards, company records and welcoming letters individually. The operator manually inserts the policies into her electric typewriter, but the other three machines are fed automatically. Programing of each bank is identical. All four types of forms are prepared simultaneously. The actual sequence begins with the insertion, by an operator, of the welcome letter. The Auto-Typist types the date automatically and the carriage returns the letter to the name position. At this point, all four units types the customers name, address, city and state, as the operator types the information directly onto the policy. Square coops Auto-Typists are programed with instructions stored on perforated paper rolls similar to piano rolls. Storage space for the rolls is only a fraction of what was needed when the company’s letters were printed and stored in bins resembling a book-rack. Now, eight-inch square coops are used in- stead of the shelves saving considerable space. Following programed instructions, the automatic typewriter goes on to type the word “Dear” as soon as the address has been completed. The operator then manually types the name on the letter, adding a personal touch to what otherwise is a regular form letter. The Auto-Typist continues to type the rest of the letter at the rate of 140 words per minute. While that is going on, both slave units are cut off and the operator returns to the electric typewriter to complete the policy. A light panel consisting of eight stations indicates the steps involved in competing one cycle of this policy-writing operation. Should the operator be interrupted in the middle of the cycle, she could return to it immediately by checking the light panel to see where she had left off. A bank of machines Particularly in the letter-writing stage, accuracy is letter-and grammar-perfect with this system. Editing and checking now involves the reading of only one copy; the rest are identical. Haas also is impressed by the fact that the initial investment for the equipment is low. “We feel that these units pay for themselves in less than eight months,” he says. “Additionally, we’re experiencing a savings in space and we’re getting a higher degree of accuracy. We are so satisfied with our installation that we are studying using the policy-writer for other operations. Combined Insurance’s use of Auto-Typists does not end with policy-writing. Additional units are employed in turning out form letters which are sent to doctors, policy-holders and the company salesmen and letters for use in promotional work and community service. Equipment in the general correspondence department amounts to two banks of three units apiece. The letter-writing operation consists of typing the name, address and date on each machine, setting the unit on automatic and moving on to the next machine to repeat the operation. 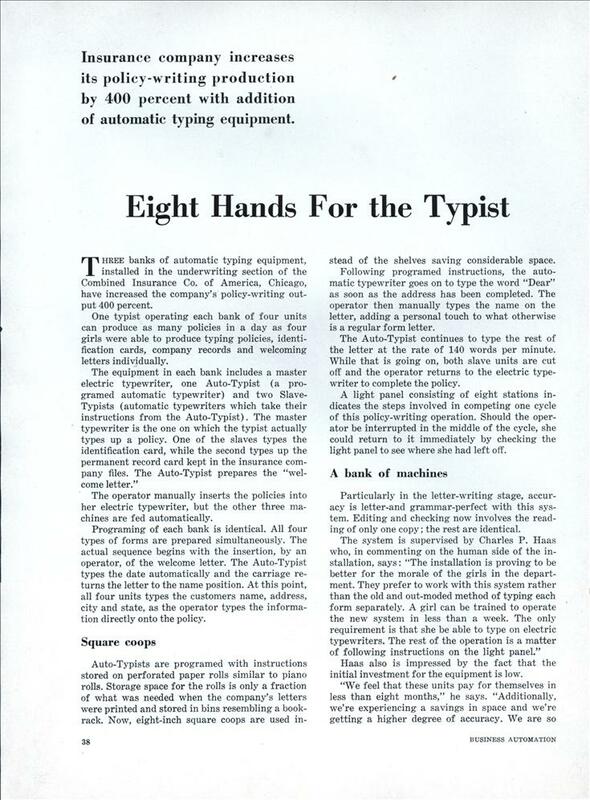 The automatic typewriters may be stopped at any point to insert a personalized remark, such as adding the person’s name or including a small statement intended to make the letter a bit more informal. The machine is then turned on again and the form letter continues to completion. Aside from the important personalized injection into the form letters, an additional benefit cited by Haas is that the waste of form letters now has been practically eliminated. One girl and a bank of machines turns out 130 policies per day in the policy-writing section. Three banks in operation means close to 400 pol- icies written daily. The form letter section produces one letter every three-and-one-half minutes. Combined Insurance is the nation’s second largest exclusive health and accident insurance company. 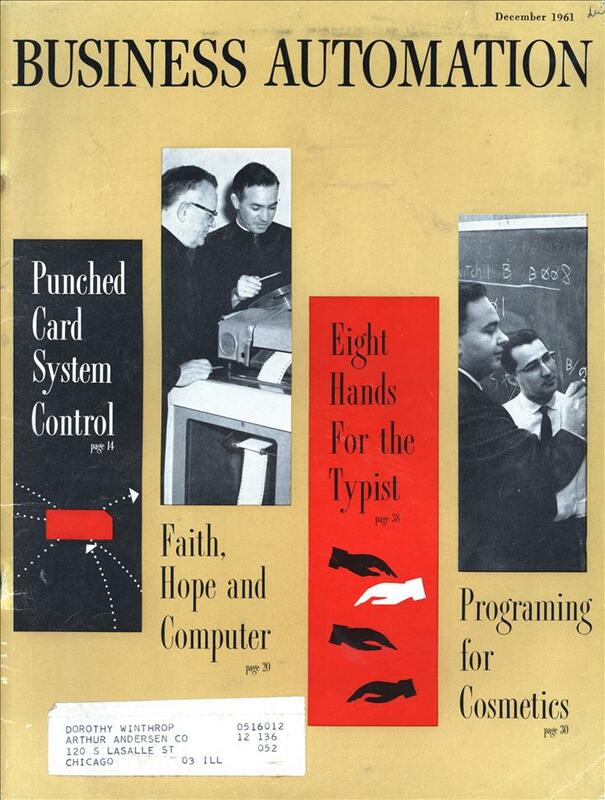 Ten years ago, the company installed a single Auto-Typist unit in the claims department. Through rapid expansion, the necessity for expanding procedures and eliminating bottlenecks became more and more apparent. The solution was found in the versatile automatic typewriter unit. After studying the unit in the claims department, the equipment also was adapted to policy-writing and form letter preparation in the underwriting department. The settlement of a claim is a push-button operation, performed by the typist. She types the information needed on the claim check voucher, and when she comes to the place where the explanation is needed, she pushes one of 25 buttons, each of which represents a different explanation. In a separate notation on the form, the claims ad jus-tor has indicated which explanation is to be used. Combined Insurance’s growth over the past decade necessitated a move to a six-story building two years ago, and the building is soon to be doubled. New premiums written in 1959 totaled slightly more than $6 million; for 1960, close to $32 million. The company employs 550 people; has offices in Toronto, Hawaii, Australia and Puerto Rico, besides all the major cities in the continental United States; and owns three other companies in Boston; Fond du Lac, Wis.; and Dallas. When was the last time it was okay to refer to one’s female employees as “girls”? They’d be treading on dangerous grounds if they did that today.